Was that a good example? Let me take it back out of the “geek” closet for a moment. Using a professional, third-party Audit, Legal, Security or IT Managed Service Provider (outsourced IT) usually provides good results as long as they are accredited (see above paragraph on basic credentials). They go in to the organization interviewing, collecting some documentation, running scans on the networks and provide a comprehensive, detailed project plan to achieve compliance. Somewhere between 4-6 weeks after the flurry of activity is over, and the world moves on, the final report appears. The HIPAA Security Risk Analysis and Assessment (SRA) report is a combination of art, content, and most-importantly; it highlights serious risks to the organization. Except there is one problem – you now need a project deployment team to convert this static SRA report into an ongoing risk management plan (prioritized by risk-level), get status reports on tasks, research Policies and Procedures, track progress, send email or meeting reminders, and track all of this towards HIPAA compliance. This is a huge administrative burden! 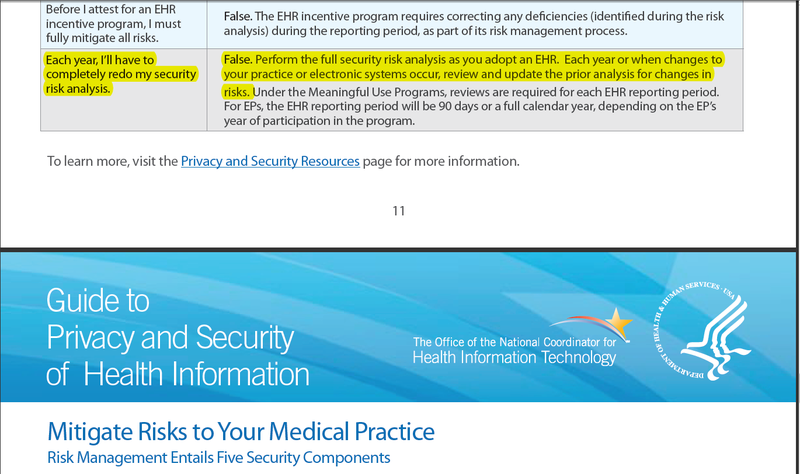 Myth #1 – We will update the plan from last year’s SRA for Meaningful Use reporting and attestation. 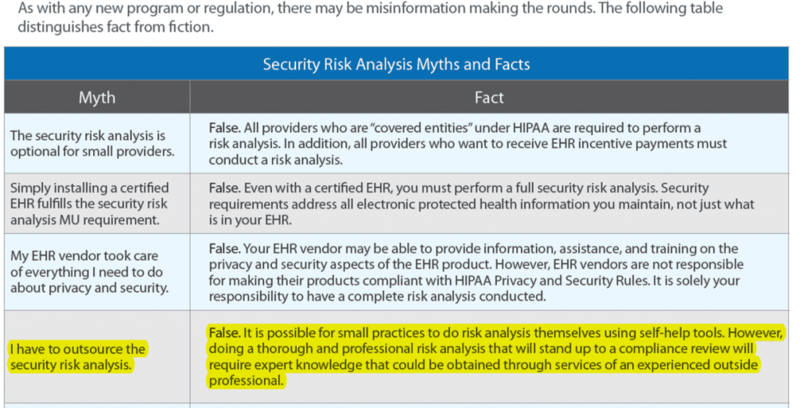 HIPAA One® take: False – this is called updating the progress of last year’s security risk management plan (see more in Myth #2 below). 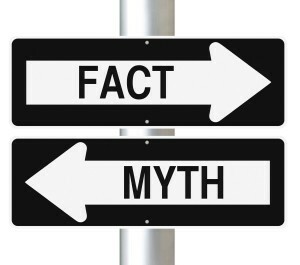 Myth #2 – Each year, I’ll have to completely redo my security risk analysis. 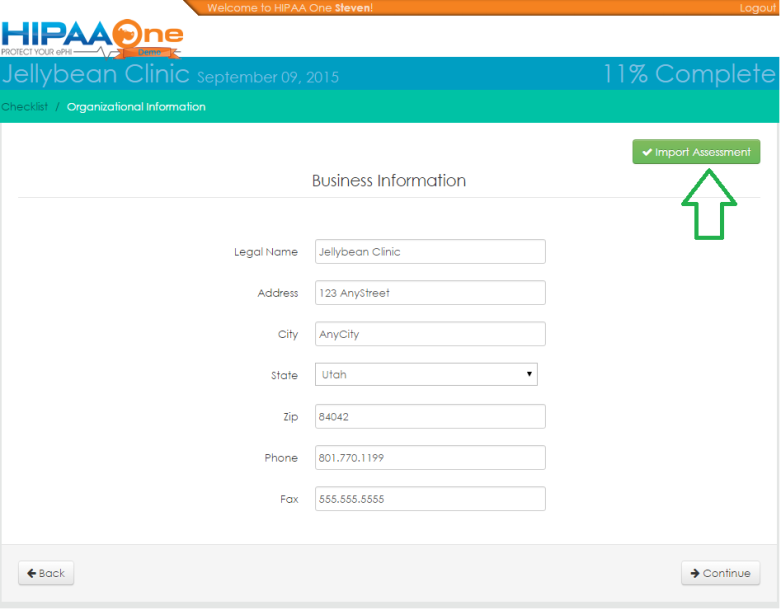 HIPAA One® take: Things change on a constant-basis. Roles change, network computer systems are changed to meet new requirements, and internal processes change too. “Updating the prior analysis for changes in risks.” means conducting a gap assessment and risk analysis on any of those items that changed from last year. Since tracking these changes is a near-impossible task (ITIL Change Management processes are being widely-adopted to tackle this), HIPAA One® will allow a full-import of last-year’s HIPAA Security Risk Analysis (SRA) allowing a review of each question to see what has changed. Ongoing tracking is built-in after the SRA is over and automated documentation requirements simplify audit responses by pressing a “Print” button. 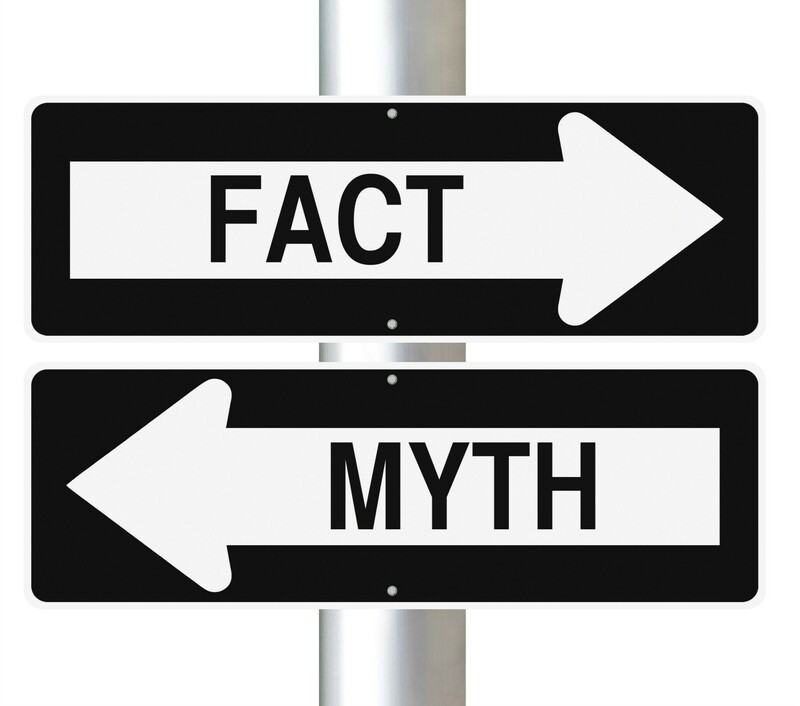 Myth #3 – I have to outsource the security risk analysis. I have to outsource our Risk Analysis. HIPAA One® take: If you haven’t had a third-party come in the past 3 years, or ever, then we would strongly recommend outsourcing one to ensure your efforts stand up to a compliance review. The first year of compliance efforts are expensive however, year 2 should be roughly 50% of what year 1 is as investments are implemented. The Security Risk Analysis should contribute to that 50% savings by automating the mundane, error-prone and labor-intensive steps to conduct the risk analysis. HIPAA One® accomplishes this by accelerating each person’s efforts by a 5x factor; using automation vs any manual-based risk analysis while learning from the experience. In year 2 this allows you, the non-certified auditor, to simply press the “Import Last Year’s Assessment” button and HIPAA One® allows you to insource, instead of outsource. We have tried to stay out of the geek-closet for this blog as much as possible and realize this is a very jargon-clad specification. 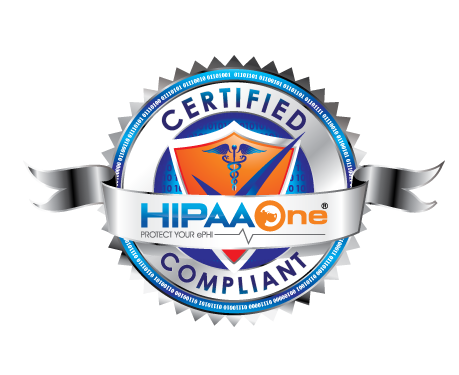 Let us at HIPAA One® along with our esteemed partners help provide the software, assurance and peace-of-mind for your organization. Contact us today to get your Meaningful Use HIPAA Security Risk Analysis done before the Holidays! Affinity Health Plan, Inc., a not for profit, will settle prospective violations of the Health Insurance Portability and Accountability Act of 1996 (HIPAA) Privacy and Security Rules for $1,215,780 with the U.S. Department of Health and Human Services. HIPAA covered entities, like Affinity, are require to report to Health and Human Services when protected health information has been disclosed. CBS evening news did an investigatory report in which they purchased photocopiers that had previously been leased by Affinity. In so doing CBS found that confidential medical information had never been erased from the hard drive. Affinity filed a breach report after CBS informed them of the medical information found on the hard drives. Affinity revealed without consent protected health information of an estimated 344,579 individuals when it returned multiple photocopiers to leasing agents before confidential customer information had been removed from hard drive. Affinity has an agreement of a settlement of $1,215,780, to take precautions to guard electronic protected health information, and to attempt to recover all hard drives that were used on the leased photocopiers. You can read more about the agreement here. Make sure that your data is secure and that you mitigate as much risk as possible by engaging with HIPAA One.